What does your toddler do when you are homeschooling your older children? 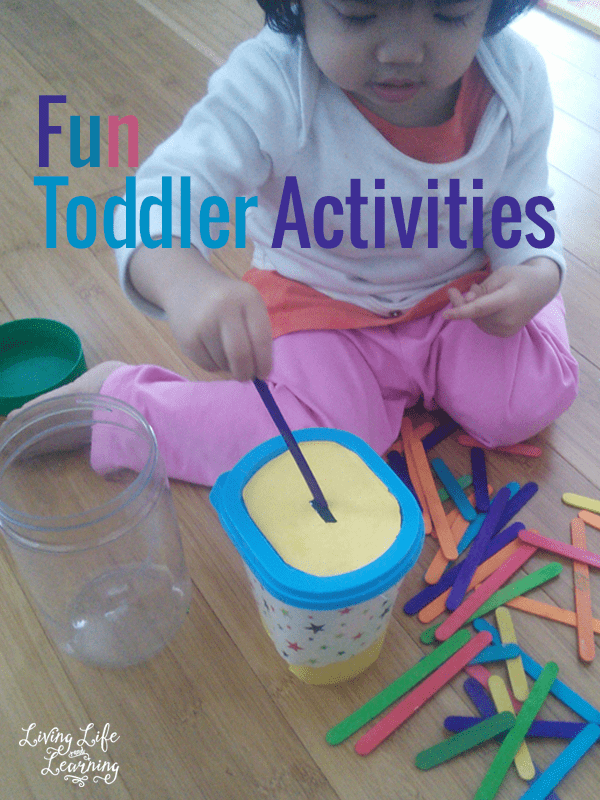 I have a bunch of fun toddler activities for my little one to occupy herself while I’m busy with the older children. Everything that you need can be purchased from the dollar store or found around the house. My princess loves to have her mommy time with me first, and then I can go on and focus on the older children. What can my toddler do while I’m busy homeschooling? books – Mo Willems, Eric Carle, Are you my Mother?, Mr. Brown Can Moo, Go, Dog, Go! 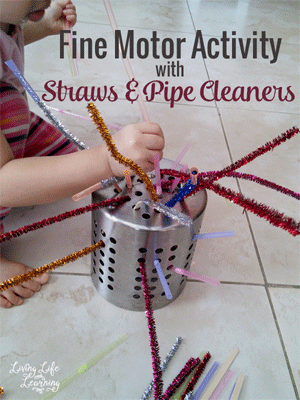 You can get your child’s fine motor skills going with some really great activities. I don’t believe in spending a lot of money on toys when young children prefer to play with the boxes that the toy comes in. I have a lot of empty containers, in the photos you’ll see tea containers and peanut butter jars, they are so durable I use them to store all of my craft supplies and baby’s activities. She knows how to open them herself so it’s something that she can do on her own. I used Christmas wrapping paper to jazz them up. I also use them to store the boys school supplies on their desk. They can be used to count and sort by color. 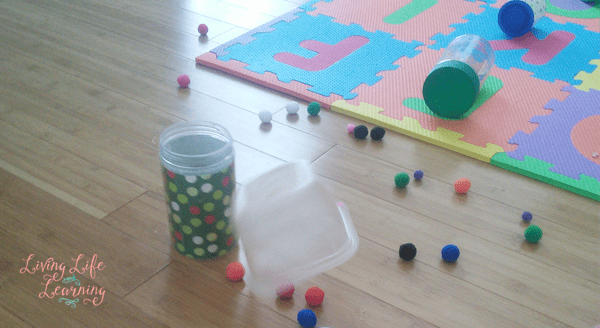 I have two containers for her to transfer the small pom poms from one to another with a pair of plastic tweezers, she can also use the plastic measuring scoop as well. We bought my son a Marble Run for his birthday so I used the tubes and attached them to our stairs for baby to place pom poms at the top and drop them into a cup. This can also be done using toilet paper or paper towel rolls as well. My son took those plastic marble run pieces and placed the pom poms in them and used it as a blow gun. Oh boys and their weapons. I had my hubby drill holes into the lid and I cut up the pipe cleaners so that baby could place them into the jar through the holes on top. I used an old yogurt container and then cut a hole into the top where she could slide in popsicle sticks. My daughter loves to play with water and since it so cold now, I’ll have her stand at the sink and play in there with different sized bowls, scoops and toys. This is also a favorite game for my 6 year old. 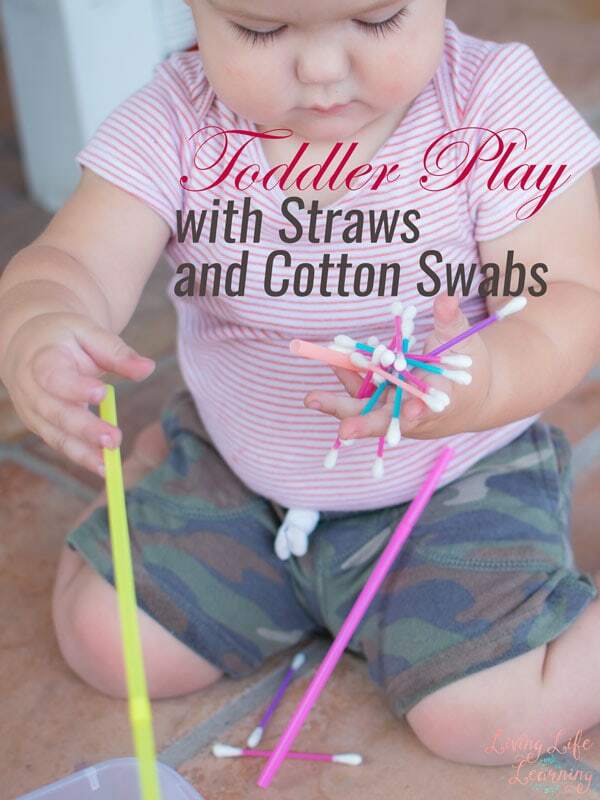 What fun toddler activities does your little one like to do? Let me know, I’m always looking for fun and new (also frugal) ways to entertain my children. Please don’t walk away from this post thinking that I have all the answers and my house and kids are perfect. That is definitely not the case. This is what things look like when we’re finished and things get thrown about the room. It takes them 2 hours to clean it up and I refuse to so it sits like this until they’re ready to have their screen time after school. That’s when you see them speed up like a super hero and get things all cleaned up so they can play video games or watch TV. Which is why there are no electronics during our school day. If you want to make it easy on yourself, have a set of quiet bins available for your toddler to play with on their own. This is great if you need a little quiet time, need to work with older children or you need a break as you’re making dinner. 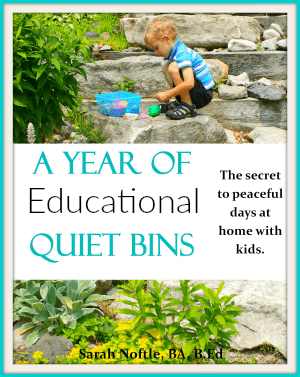 A Year of Educational Quiet Bins can really save your sanity. Be sure to read my Fine Motor Activity with Straws. I have a bag of items to keep my 3 year old busy – many of the same items you listed. Some other things are shoe laces and old spice containers (lacing practice), old sour cream container with a hole in the top and dried beans, marbles for marble painting, and felt cupcake busy bag (probably a Pinterest find). That bag is my go-to resource when she’s getting bored and cranky! I don’t trust her with marbles just yet, she plays with her brother’s marble run but she’s closely supervised. I love felt, I have to put something together for her to use. true. My very smart toddler son seemed so beyond putting inappropriate things in his mouth, until he did! Better to play it safe! He had a brief choking spell but was fine after, lesson learned by mom. Lots of great ideas!! I use a lot of printables and busy bag type activities in addition to what you’ve already listed. 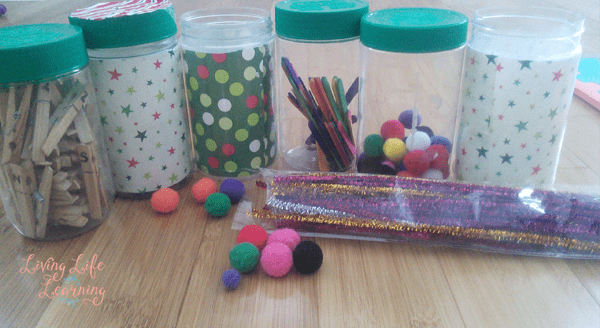 We also LOVE pompoms and pipe cleaners with containers around here. One thing we like to do is use a cheese shaker to put pipe cleaners in and then add Cheerios to the pipe cleaners (pony beads for the older kids). We’ve never used popsicle sticks in this way though, we have used them for crafts though. Right now Harold is loving being able to stack pegs together. Though those aren’t quite as frugal. He also loves mega blocks. Thanks for stopping by and linking up with Toddler Idea Tuesday! I am pinning your post to my Toddler Idea board. My son just turned 1, and we got SOOO many gifts for his birthday that light up and make noise… but his favorite toy has continued to be the dog bowl. 1.) I took an empty egg carton and painted 2 of the holes each color ( red, orange, yellow, green, blue, purple) and put a plastic Easter egg of each same color in the matching hole. Now he is only 2 and is still figuring it out. It he LOVED this activity. Not only will it help him with color recognition, but the each of pitting the egg in a slot promotes fine motor skills! 2.) I filled a. If bucked with uncooked white rice ; and some of my home syed rainbow rice) and added little objects from around the house, and a bunch of scrabble letters…then added a sand shovel and siftet, and it’s like a mini sand box (minus the sand) it keeps him occupied for Arbleasg 30 minutes, closer to an hour… And is definately a great sensory and fine motor skill activity! And he is finding the scrabble letters and I tell him what letter he found so that makes it even better!! We have a huge tub box full of colored rice as well, my kids love it. Oh my, I just realized that the autocorrect on my phone really botched that comment! Sorry if it was confusing ! Such a great ideas. We have pompoms and play dough…My baby much more interested in painting so I bought painting sets last week. My kids love painting, it’s such a great messy play. what a great list. My daughter has enjoyed many of these. We’ll have to check out some of the others. Lots of great ideas here to keep a little one busy. It’s funny you mention not spending a lot of money on stuff because my kids used to love to drag out my pots/pans to play. A lot of the time it seemed like they enjoyed normal things around the house more than toys. 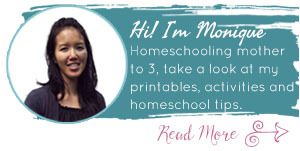 Thanks for linking up with us on the Hip Homeschool Hop! These are some great ideas for things toddlers can have fun with that don’t cost a lot of money. I’m glad you shared with us! Fun ideas! Featured you on Mom’s Library this week!